Ironically, this was written a few weeks ago and I put it aside. For some reason, at the time I wasn’t ready to share this. The picture on my homepage is a beautiful mountain landscape, taken from my favorite hike at Waldo Canyon (and posted prior to the recent fire and destruction of Waldo). Many years ago in 1998 I discovered that hike during a difficult summer of going through a life-changing, traumatic experience. I was very young, and I was trying to put the pieces of life back together. My wonderful parents were with me on most of my many hikes on that trail and were a huge support to me that summer. We spent each two-and-a-half hour hike processing my circumstances and decisions. Most importantly, their unconditional love and support pointed me to God and taught me something about crying out to Him in my time of emotional turmoil. The years following, I spent many days hiking and running at Waldo Canyon with various friends and family members. I think it became my favorite hike not only because of the beautiful scenery but because of the many important moments I shared along that trail. The best way to describe it for me is I always felt close to God when I was at Waldo Canyon. Sometimes you don’t even realize the meaning behind something until you look back on it, even years later. In 2002 I began dating my amazing husband. We have almost been married seven years! During our three years of dating, we experienced a lot of outdoor adventures, as we both love to be active. We hiked a lot of trails, including this one! One gorgeous day in May 2005, we decided to hike here. As we were hiking and talking, I was looking at the ground and I noticed a few rose pedals on the trail. The rose pedals became thicker and soon led up to a large rock overlooking the many peaks around us. It took me awhile to get my bearings and piece together my husband’s upcoming proposal. 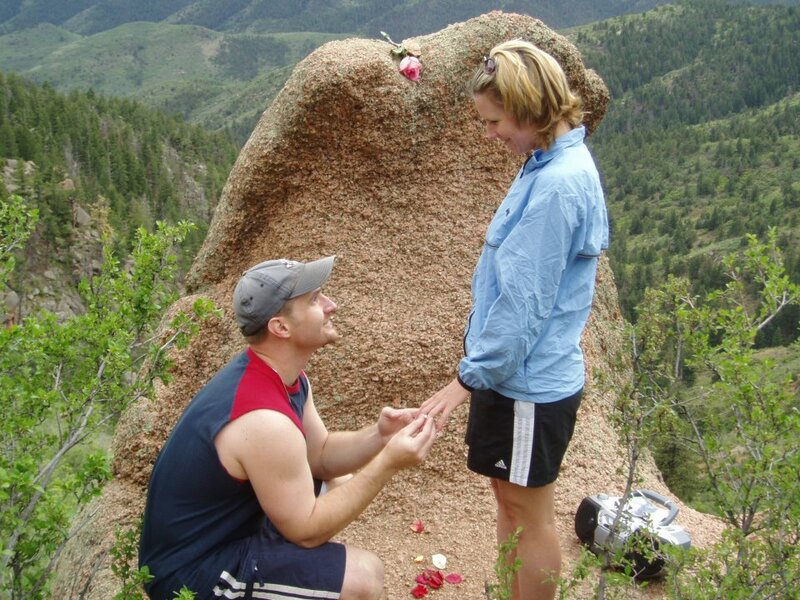 Beside that rock, with my hands in his, he asked me to marry him. One of the pink roses given to me that day was placed on the “rock” and we took the picture you can see on my homepage. That flower was preserved and now sits in a commemorative glass box in our bedroom so that we can remember that special day. But to tell you the truth, this picture means more to me than anything and here’s why: it wasn’t until a few days after our engagement that I was able to realize that a bad story journeyed on this trail intersected with a new story of love and joy. Same trail, different story. The rock where I used to stop and take a water break while pondering a painful journey became the same spot seven years later where I would find a man kneeling with a ring. My husband did not know the meaning of this trail – he did not plan this out. It just happened. And I didn’t see this symbol of redemption until I thought of it later. Since writing this post, Waldo Canyon had been consumed with fire, and today it still burns. My heart aches. But I’m grateful for the memories and moments I enjoyed there…and I will never forget. And more importantly, I continue to pray for the fire to be contained, and for protection for the homes in jeopardy. © Kristin Gordley and Moments In The Story, June 2012. Categories: Redemption, Uncategorized | Tags: Memories, Redemption, Stories, Waldo Canyon, Waldo Canyon Meaning, Waldo Canyon Memories | Permalink. I was struck the other day by how each day is filled with so many choices for me to make. Take for instance my interactions with my son. I could have fifty patient responses toward him, and in one instance of frustration, blow up at him. We had a series of tough days recently and I’ve been feeling the regret of making some bad choices in responding harshly to him. I know my son feels loved by me, but I feel the weight of hurting him. Welcome to parenthood, right? On the flip side, because there are so many loving responses I give him and so many good memories (or moments) I’m able to create with him, he seems to give me grace when I fail. About two seconds after I yelled the other day, he was trying to play with me by pretending to squirt me with a squirt gun. Talk about redirecting a bad interaction into something positive! I should learn from my three-year-old. I’m learning that the conflicts in life and in our relationships also contribute to how great those relationships are. When you overcome things with someone, it draws you closer to them. When you go the long haul and experience a period of years with a spouse you look back and realize there are a lot of highs and lows that got you to the place you are at now….together. I think it’s important to realize that the moments creating our story are going to be a mixture of good and bad. But overall, our story makes us better and better. And each day we have new opportunities to make choices that will contribute to that story. So I’m now convincing myself to stop stressing over my parenting mistakes and just keep trying to make good choices. Those good choices will add up to a good story…and a bad choice here and there will never destroy my story! Categories: Parenting, Uncategorized | Tags: Grace, Stories | Permalink. I already have a passion for stories – I seem to see them all the time. I see things in my friends, family members, and in me. I believe there is a great story we are a part of, and we each live out small stories in our everyday lives. I loved this book because it has put words to my interest in the concept of story and why it is important. The author’s study of how to make a movie – based on his life – forces him to look at what makes a story truly great. The writers of his movie had to create more dramatic moments to make his life interesting…which gets him thinking about how he could actually make his life more meaningful…and in turn live out a better story. He begins to create new adventures for himself and through that process realizes that the stories he lives get better as he gives more and more of himself to others. He experiences the highs and lows of life but finds a way to see them as important pieces that make his story one of a life transformed for the better. I highly recommend reading this book! I got so much out of it both times. I have been thinking about starting a blog for a long time. It’s mostly for me to write about what I’m learning and what is important to me, and hopefully it will be an encouragement to anyone else who is interested! I will be sharing more specifics about what I’m learning about living good stories…how this is a choice and a way of life that does not always come naturally. I have made many mistakes in the past which have cost me. That must be why I love good stories, I love being inspired by people who choose them. I want to choose them. Categories: Uncategorized | Tags: A Million Miles in a Thousand Years, Stories | Permalink.